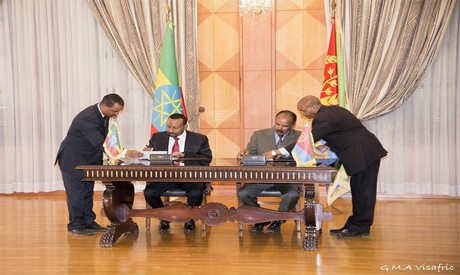 Ethiopia to roll out Eritrea deal fast to "make up for lost opportunities"
Landlocked Ethiopia wants to make the re-opening of two roads connecting it to two of Eritrea's Red Sea ports a priority in the two nations' reconciliation process, a government spokesman said on Wednesday. The historic reconciliation could transform politics and security in the volatile Horn region, which lies along one of the world's busiest shipping routes. Ethiopian government spokesman Ahmed Shide said on Wednesday that the reopening of two critical roads leading to the ports of Assab in Eritrea's south and Massawa in the north would benefit the whole region. "The unfolding developments will not only benefit our peoples, but the entire Horn of Africa region will be a part of these developments," Shide was quoted as saying in an interview published on the Eritrean information ministry's website. Also on Wednesday, Ethiopian Prime Minister Abiy Ahmed's chief of staff wrote on Twitter that Ethiopian and Eritrean passport holders would be able to travel to the other country and obtain visas on arrival. Access to the ports of Assab and Massawa could greatly help Ethiopia's push to boost their exports and increase hard currency earnings, analysts say.